During the late 1800’s and early 1900’s, emigrants from Trentino found work in the coal mines surrounding the Las Animas County town of Trinidad (Hastings, Ludlow, Primero, Starkville, Segundo), located 15 miles from the Colorado – New Mexico border. During the 1880’s, Trinidad was a rest stop on the historic Santa Fe trail and home to such famous “Old West” personalities as “Doc” Holliday and Bat Masterson. Additionally, famed lawman Wyatt Earp drove a stagecoach between Trinidad and other southwestern towns. 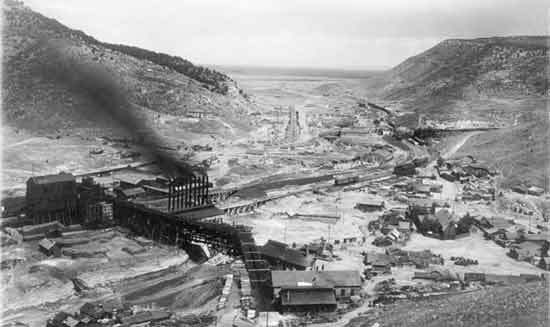 These mines and those of other areas of Colorado (Silverton, Walsenburg, Leadville, Central City) attracted our ancestors, who worked long days for low pay. The dangers of mining is evident by the hundreds of graves around the mining towns. Hastings and the Victor American Fuel Company facilities. My grandparents and many other Trentino emigrants lived and worked here. The mine at Hastings shown in the photo below was abandoned in the 1920’s, and by the 1950’s, most traces of the town had disappeared. Colorado Historical Society — has the Aultman photo collection from the late 1890s to the early 1900s. I found photos of relatives here. Input your ancestor’s surname in the search box to see if a photo exists. Naturalization Petitions — this listing includes emigrants from Trentino who petitioned to become US citizens in the Walsenburg, Colorado area. Listing is by last name, and copies of documents may be ordered. Includes names such as Andreatta, Bellotti, Benedetti, Bergamo, Brentari, Brunelli, Mattivi, Menapace, Micheli, Zancanella, and others. Gilpin County Marriages Index — a listing of brides and grooms marrying in the county. Search is by last name, and copies of the documents may be ordered. Includes names such as Casagrande, Dalsant, Eccker, Moser, Pinamonti, Valentini. TrinidadCo – devoted to activities in and around Trinidad, Colorado. This site provides a historical walking tour of Trinidad, building a bridge from the past to the future. Colorado Alliance of Research Libraries— On-line catalog of books held by various libraries in Colorado. You can search by subject, author, title, or word. Inputting a surname, place name, or other search term will bring up a listing of books on that term and the location of the library holding a copy. Once you know the name or author of the book, you may be able to arrange an interlibrary loan of the book through your local public or school library. Hillside Cemetery is located near the former Silverton mining camp. Many of our ancestors from Trentino are buried here. They bear names such as Andreatta, Anesi, Casagrande, Corazza, Dalla (Dallavalle), Dallapiccola, Dalsant, Dalpra, Eccher, Fedriiz, Mattivi, Zancanella, and Zanoni. This site also contains interesting articles on the “Americanization” of Trentino surnames (Dallavalle in Trentino to Dalla in the US; Maffei in Trentino to Maffey in the US). This entry was posted in Genealogy and tagged ancestors, Colorado, Hasting, Trinidad Colorado. Bookmark the permalink.